According to different applications and locations, the selection of material for heat exchanger is different. Small type cooling tower usually uses red copper heat exchanger with its malleability that achieves heat transfer efficiency. On the other hand, stainless steel heat exchanger tube is used in the coast area or corrosive environment. 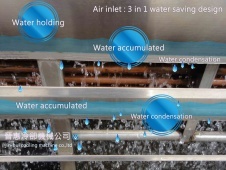 However, stainless steel heat exchanger tube that is used in small cooling tower has lower heat conduction. 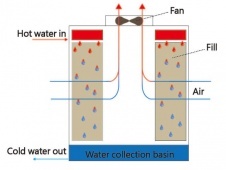 Therefore, the heat transfer area needs to design bigger than before. On the contrary, big type cooling tower doesn’t have obvious effect when choosing this material for heat exchanger. If the price or heat exchanger renewal is under your consideration, we suggest that customers use galvanized steel tube as economical choice. 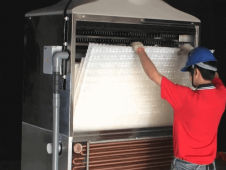 For some special fluid used for cooling such as fertilizer, acid liquid or other expensive fluids, it is recommended that using plastic heat exchanger tube to clean impurities. Because of smaller heat capacity, we just need to increase the heat exchange area of plastic tube; and then, the cooling effect can be overcome.